Footwear Tips for Kids' Flat Feet | Podiatry Associates, P.C. This fall, be sure to take the kids to Flat Acres Farm in Parker—from a giant hay bale maze and pumpkin patch to the haunted maze so fun it’s scary, there’s something for everyone in the family to enjoy. However if you’re concerned that your child’s feet are as flat as the farm’s name, here are some shoe-shopping tips to calm your concerns and keep your kid’s feet feeling spooktacular! Flat feet lack the natural support system arches provide, so often times other tendons, muscles, and bones compensate which can cause problems. A good shoe along with orthotic inserts can provide the support pediatric flat feet need to reduce compensation along with the discomfort it may bring. So, the first thing to keep in mind when shopping for flat feet footwear is good support through the middle of the shoe. Also, look for single piece, low to the ground soles to keep feet in proper position and allow for lateral and other movements involved in running, jumping, climbing, and all the stuff kids do. 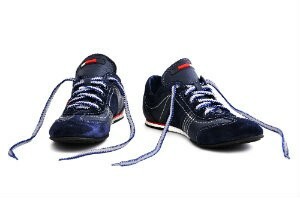 Make sure footwear is made of breathable materials like leather, canvas, or mesh. Give ‘em the bend test – hold the shoe at the toe and heel then bend both ends up. It should bend where your child’s toes would naturally bend as well. The toe box should be wide enough to give plenty of wiggle room and there should be about a thumb’s width between the longest toe and the front of the shoe. Always have your child’s feet measured, and since feet naturally swell throughout the day, try on shoes at day’s end to ensure the best fit. Finally, ask us about custom orthotics that are designed with the unique specifications of your child’s feet. These not only offer additional support, but provide added comfort too. In most cases of pediatric flat foot, following these guidelines is enough to keep kids’ feet feeling good and up for some fall family fun. If, however, your child is complaining of pain or cramping, or has no desire to participate in activities, call Dr. O at Podiatry Associates, P.C. in Castle Pines, Cherry Creek in Denver, and Parker, CO. We can determine if an alternate treatment plan is necessary and get your child’s feet feeling great again. You can reach us by filling out our online appointment request form, or by calling (303) 805-5156.